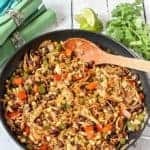 Veggie burger scramble is a quick and easy one-pan meal that’s vegan, gluten free and ready in about 20 minutes – great for a light but filling weeknight dinner! Happy Monday, friends! I hope you had a fun weekend! We got our first snow here in N.C. on Saturday and while we didn’t have much stick (less than an inch), we made the best of it, as we have to do here in the South when we get a dusting. We did a small bit of sledding in the neighbor’s yard until it turned to mud, had hot chocolate, and went to a neighborhood fire pit party. We’d also finally gotten a working fireplace this past week (a Christmas present between my husband and I), which was perfectly timed! 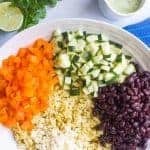 As for the food, I’ve got another meatless Monday dinner for you today! 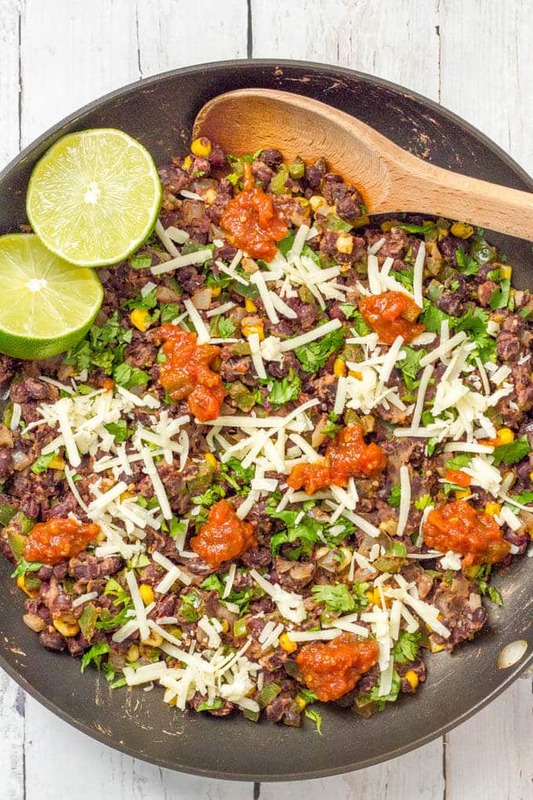 And it’s another one-pan dinner, just like last week’s southwest vegetarian quinoa skillet. Today we’ve got Veggie Burger Scramble, which I also like to call a veggie un-burger. 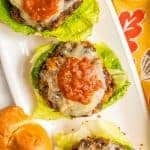 You get all the great flavors of a delicious black bean burger but without the fussing over forming patties and flipping them. Yes, I’m that lazy. Not even sorry about it either! I mean, I do have my simplified veggie burger, which requires just 3 basic ingredients, plus spices, and comes out with really big flavor. And they are so good and I try to always have some on hand in the freezer to pull out for a quick lunch for me while I’m working. But this is even easier! Instead of making a patty mixture, you just sauté everything together in the pan and you’re all set for a delicious dinner! 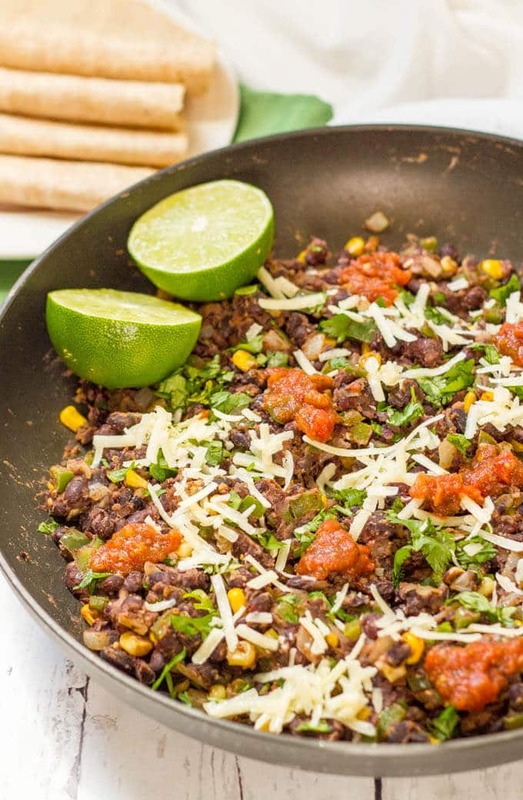 It’s a one-skillet dish so easy clean-up too! Plus, it’s vegan, gluten-free and there’s lots of ways to serve it! 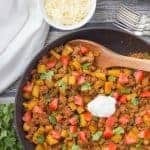 You can stuff this into lettuce wraps or tortillas or pita bread for a lighter or lower-carb version, instead of using the traditional burger bun. 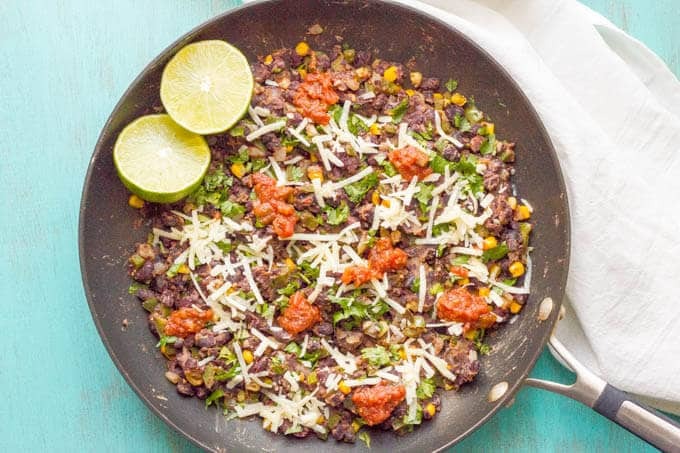 It’s a great option for a light dinner and the leftovers make a yummy lunch! 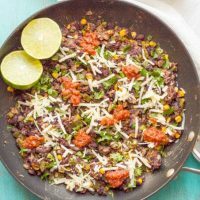 Mashing the beans makes a big difference, so don’t skip that step. It really adds to the texture and gives this mixture a veggie burger feel. So does finely chopping the veggies so take the time to do that as well. If you want to make this veggie burger scramble a little spicy, you can add a finely chopped jalapeño with the onion and green pepper. You could also add 1/4 teaspoon red pepper flakes along with the other seasonings. And I like to serve it with some hot sauce on the top. We love the New Orleans-based Crystal brand. 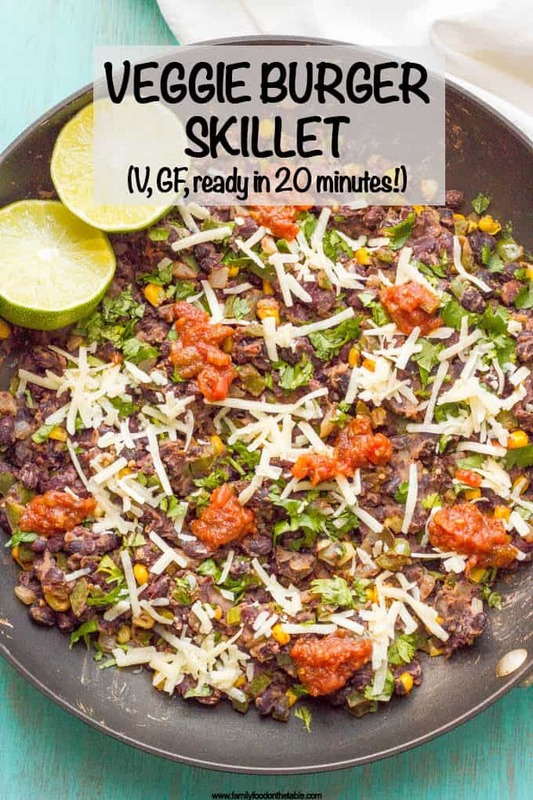 I’ve included an optional step in the recipe below (#5) if you want to give this veggie scramble a slight crust on the outside. If you want it soft, just skip that step. As I said, you can serve this in a regular bun but can also make it a bit different by serving it in tortillas or pita bread or making a lettuce wrap with the mixture. I hope you give this veggie burger scramble a try for your next meatless Monday dinner! 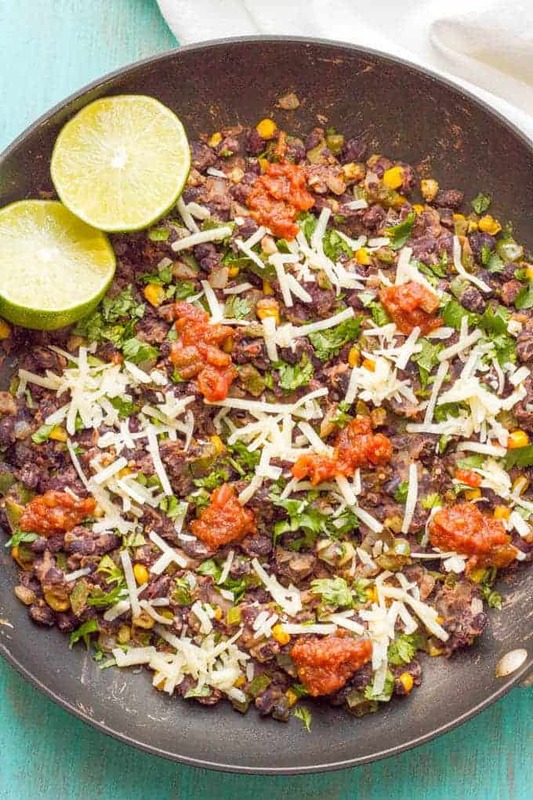 Here’s to super duper easy recipes that taste great and fill you up without weighing you down! P.S. Love veggie burgers as much as I do? 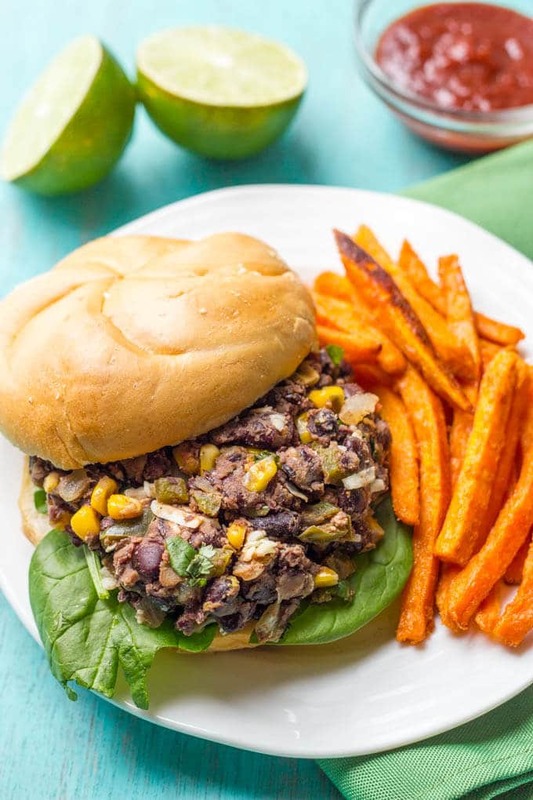 Check out my black-eyed peas burgers and my butternut squash black bean quinoa burgers. Also, check out my newest VIDEO for this easy veggie burger scramble! Veggie burger scramble is a quick and easy one-pan dinner that’s vegan, gluten free and ready in about 20 minutes! Add onion and bell pepper and sauté until tender, about 5 minutes. Add garlic and sauté an additional 30 seconds. 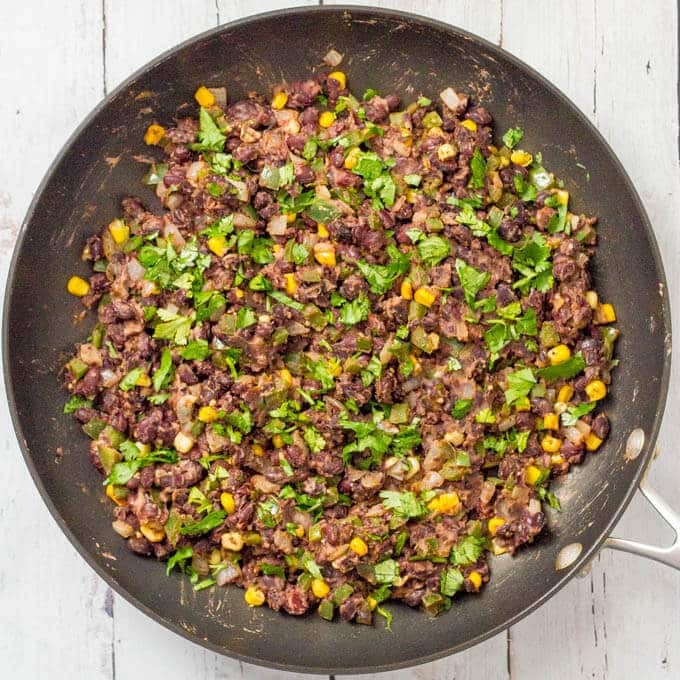 Add corn and lightly mashed black beans and stir to combine and warm through. Add lime zest, chili powder, cumin, salt and pepper and stir to combine. To create a crust, turn the heat up to medium high and use a spatula to flatten the scramble mixture onto the bottom of the skillet to create a sear. Cook for 1-2 minutes, until well browned, then flip and cook for another minute on the other side. 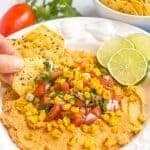 Finish with a squeeze of lime juice and serve hot with desired toppings. 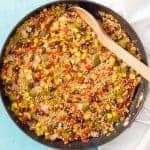 If you want to make this veggie burger scramble spicy, you can add a finely chopped jalapeño with the onion and green pepper. You could also add 1/4 teaspoon red pepper flakes along with the other seasonings. And I like to serve it with some hot sauce on the top. Step #5 is optional if you want to give this scramble a slight crust on the outside. If you want it soft, just skip that step. What a cute idea!! The video is great!! Glad you guys enjoyed the snow!! I know we sure did too! Snow just makes everything sooooo pretty if you ask me. And I am loving that there is still snow on the ground here. Something about the sparkle of snow just makes me feel so cozy inside. <3 Oh, CONGRATS on the fireplace! Bourbon and a fire? That is LIFE right there! 😉 Anyways, LOVE this scramble, Kathryn!! This is so unique and it looks absolutely delicious! LOVE that you used veggie burgers in here! I could totally go for a pan of this for breakfast right now! Cheers, dear! Kathryn–you know I love these! And SO SO much better than any pre-made veggie burger. That sounds flavorful! Great video too! Very obsessed with this dish right now. SO good!